← Merry Christmas from Cinedrome! The Return of the King is at hand. 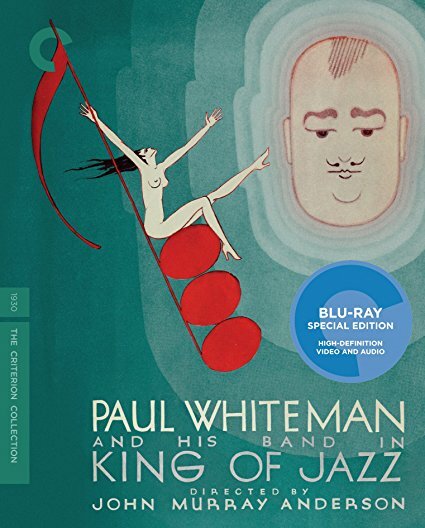 As you can see from the picture, I’m talking about King of Jazz (1930), the spectacular, groundbreaking revue from Universal Pictures that showcased bandleader Paul Whiteman and his Orchestra, the Oscar-winning sets of Herman Rosse, the eye-popping imagination of director John Murray Anderson, and the screen debut of Bing Crosby. I shall not mince words. This is a case of buy-this-disc-or-never-dare-to-call-yourself-a-movie-lover-again. I don’t care how many thousands of Blu-rays, DVDs, laserdiscs, videotapes or film prints you may have; if you don’t get this, the first and only authentic King of Jazz, your collection will be forever incomplete. I wrote about King of Jazz here and here; click over for details of the making, unmaking, disappearance, and rescue of the landmark in Hollywood history. I think I’m safe in saying that never before has a movie so unique and so good lost this much money ($1.2 million in 1930 dollars; multiply by about a hundred to get an idea of that amount today), dropped out of sight for so long, or surfaced (in a 1980s VHS) in more mangled form before finally emerging in a flawless and virtually-complete restoration. My disc of King of Jazz is on its way. When I’ve had a chance to see it (that is, to see it again, after its screening in Sacramento in February 2017) and to peruse its supplements, I’ll file a report. Until then, movie buffs, get thee to Amazon before the sun sets on another day.